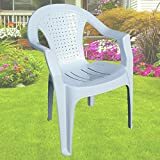 These chairs are ideal for both indoor and outdoor use, are made from strong plastic meaning they’re also waterproof, and will make a great addition to your patio or garden area. They also have a stylish straw pattern backrest, bringing a contemporary look to your home. This 4piece rattan set is a perfect solution for any garden, patio or conservatory. 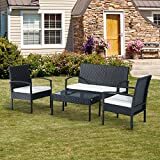 It is made of high quality steel and covered with PE rattan, it comes complete with a cushions which are covered with a flame retardant polyester. It has been designed with style and elegance so it can look at home in any décor. The table is also topped with a 5mm tempered glass for you to place drinks or magazines. This is a great choice with a minimalistic look.